Travertine is a great choice for Arizona homes. It can be used for everything from a beautiful, living room floor to a classy outdoor patio for entertaining. It can be a tile, a paver, or even a stone that can be stacked. A concrete pool deck is generic and boring. Pavers are being used with increasing frequency as people realize the beautiful design flexibility that they offer. Travertine is often used, but many people opt for the earthy tones that are so natural to the stone. While the rust and earth-colored travertine pavers might reflect the Arizona landscape well, they can also look a bit rustic and dated. Instead, opt for silver travertine pavers. They will create a sophisticated foundation for your pool area that aptly reflects the shine of the water. The stone will blend seamlessly with the water, creating a gorgeous look that you will love. You don’t have to place travertine pavers side-by-side in step as you cover an area. In fact, you don’t even have to cover an entire area with pavers to create a beautiful design. An interesting design choice that has emerged is to create a kind of gridwork with the pavers and the grass. The textures and the colors contrast with one another in an interesting way. You can create a path through your yard this way, form an accent border around a patio or other solid area, or create an entire patio this way. The avant garde design will make your backyard look like it belongs with a celebrity’s mansion. Travertine often has a rustic look, not just because of its typically earthy colors, but also because of its rough cut. If you want a more traditional look for your backyard design, that’s not a problem. But if you want something a bit more contemporary, you should choose honed pavers near Mesa. Honed travertine pavers near Mesa have a polished look that seems more glossy and luxurious than what you will find in other backyard pavers. Honed pavers are ideal for the deck around a pool, but you can also use them for everything from landscaping accents to patios. Play around with the combination of the polished finish with the different colors to see what will create the most striking look. Travertine actually comes in a variety of colors, which not many people know. Ivory or white pavers have an almost sandy look to them that is perfect for the Arizona landscape. The color is also right on trend for contemporary and luxury design. When you look through the pages of any home décor or architectural magazine, you’ll see plenty of white and ivory surfaces, from the color of the paint on the walls to the marble used on the accent wall. You can get a piece of that in your backyard design with just your selection of color. The kind of backyard pavers near Mesa you choose and how you incorporate them into your design can have a big impact on the look of your entertaining space and your home in general. Visit your local stone supply yard to get inspired by the different options available for Mesa travertine pavers, or consider incorporating some of these design choices to get a contemporary look for your backyard. 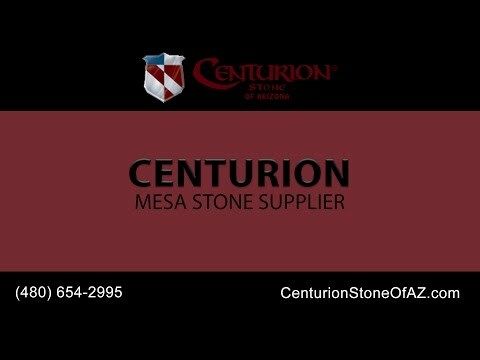 Centurion Stone of Arizona is a trusted paver supply company that has a variety of choices for backyard pavers. We have multiple color and cut choices for travertine pavers, as well as for other popular stone types, such as flagstone and limestone. Our design specialists near Mesa can help you make the right choice for your backyard pavers based on your vision and your budget. We can also help you come up with a design. Visit us today and find out why we’re the stone supply yard that Arizona home and business owners trust for their stone needs.